I own a humongous instrument. It is so big it needs 3 people to move it. It is so beautiful that it demands the attention of whoever is in the room. It resonates like only acoustic stringed instruments can. It is foreign like the language from which it comes from, and is heavier than the burden of which I felt when I never played it. Guess what it is yet? 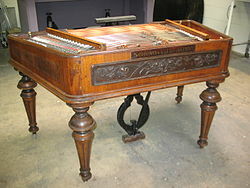 It’s the cimbalom. It is a Hungarian instrument that I wanted to learn to steal back a piece of my identity that I felt was slipping away after my father passed. What is a long and complicated story that will be truncated down to the essentials. 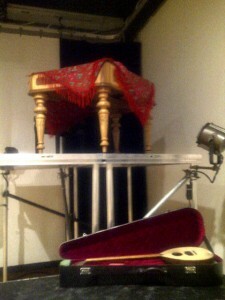 I started to take cimbalom lessons from a Hungarian man named Gyula. He was an amazing cimbalom player, yet he played to no audience at a Mexican restaurant he lived above. He told me he was renowned in Hungary, and I still do beleive him. I had a natural aptitude for the instrument, having it be rhythmic like the drums and tonal like the piano. Both instruments I play. We progressed, and after a few months the opportunity to buy one came up. Around the time I received the instrument Gyula unexpectedly died. Oddly enough, his funeral was on the one day anniversary of my Father’s death. The instrument I bought to liberate my grief, laced me with more. After this I pretty much stopped playing it. Occasionally I would muster up the will to play, but less and less, until eventually I was afraid to touch it. Then two weeks ago, my friend sent me a desperate ‘911 emergency, need your cimbalom’ text. I was hesitant to reply, and very rude with him on the phone. Eventually he convinced me that I needed to play with him for his performance at the MAI theatre… if not for myself, but then for him. I reluctantly agreed. He sat beside me as I fumbled with the sticks, with the strikes and the rhythms. I was afraid to play it because I was afraid I would break it. Afraid I would kill it. It seemed to precious yet so monstrous. My friend did a good job of snapping some sense into me, especially when he proved to me that “it’s not as sensitive as [I] think”. So, with great excitement I invite you to our shows this weekend at the MAI theatre in Jerusalem in My Heart. Here is the facebook event. Get your tickets now, it will sell out! Oh and as for the second fear, I am playing on a 10 foot platform… and I am seriously scared of heights. Like vertigo scared. My Cimbalom way up high!